Description: US 3 cent red entire postmarked blue RALEIGH, N.C., FEB 5, 1861 with matching grid cancel sent to Hillsboro, NC. Description: US 3 cent pink entire postmarked NEW YORK, DEC 2, * with fancy cancel sent to Plattsburg, NY. Description: US #73 on local drop cover postmarked NEW YORK CITY, AUG 28 with fancy cancel sent to 28 & 30 Perry St., NY City. Description: US #73 on circular rate cover postmarked AUGUSTA, ME, DEC 26, 1864 with fancy cancel sent to Athens, ME. Description: US #73 on circular rate cover postmarked COLUMBIA, S.C., MAR 15 with fancy cancel sent to Spartanburg Court House, SC. Description: US #65 on cover postmarked NEW - YORK, 27 APR with fancy cancel sent to Port Jefferson, Long Island, NY. Description: US #65 on cover postmark NEW - YORK, 26 JAN 1863 with fancy sun burst cancel sent to Boston, Mass. Description: US #65 on cover postmarked OLDPOINT COMFORT, VA., JUN 27 with fancy cross roads cancel sent to West Goffstown, New Hampshire. Description: US #65 on lined through OFFICIAL BUSINESS cover postmarked NEWBERN, N.C., MAR 29 with fancy cancel sent to Troy, Illinois. Description: US #114 on cover postmarked NEW YORK, JUL 8, 3P.M. * with fancy cancel sent to Wilmington, Illinois. Description: US #114 on cover postmarked CANAJOHARIE, N.Y., AUG 25 with fancy barrel cancel sento to Fulton Mills, NY. Description: US #112 on local drop cover from the Y.M.C.A.Â postmarked BURLINGTON, VT., FEB 18 with matching fancy circular grid cancel to the U.V.M.. Description: US #65 on Civil War patriotic cover postmarked WASHINGTON, D.C., MAR 3 sent to Taftsville, VT. Description: US #65 on Civil War patriotic cover postmarked QUASQUETON, IOA, JUN 1 sent to Jamestown, NY. Description: US. #26 on Civil War patriotic cover postmarked POTTSTOWN, Pa., AUG 6 sent to Bodsboro, Pa. Description: US 2 cent perfin on advertising GRIGGS, COOPER & CO. cover postmarked ST.PAUL, MINN., JUL 19, 1909, 4-PM sent to Virginia City, Montana. Description: CSA #7 pair o cover postmarked ATHENS, Ga. MAR sent to Griffin, Georgia. Description: CSA #7 pair on cover postmarked RICHMOND, Va., sent to Hampden Sidney, Va. Description: CSA #11 on cover postmarked red PETERSBURG, Va., MAY sent to Mocksville, NC. Description: CSA #11 on cover postmarked FAYETTEVILLE, N.C., NOV 9, 1864 sent to Oxford, NC. Description: CSA # 12 on cover postmarked RICHMOND, Va., OCT sent to Tarborough, NC. Description: CSA #12 on cover postmarked DEMOPOLIS, ALA., sent to Augusta, Ga. Description: US #11 with engraver's imprint in margins postmarked NEW YORK, JUN 17 sent to Butternuts, NY. Description: CSA #11 on adversity cover fashioned from a court document postmarked GEORGETOWN, S.C., DEC 2 and sent to Augusta, Georgia. Description: CSA #11 on cover postmarked CHAPEL HILL, N.C., AUG 26 sent to Louisburg, NC. Description: CSA #11 on cover postmarked WARRENTON, N.C., JAN 14 sent to Castania Grove, NC. Description: CSA #7 pair on cover postmarked HICKSFORD, Va., JAN sent to Leicester, NC. Note the filled in frame lines on the stamp design. 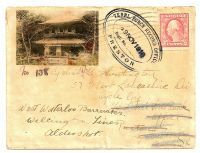 Description: CSA #11 on cover postmarked YORKVILLE, S.C., JAN 3 sent to Dallas, NC. Description: CSA #7 pair on cover postmarked WINCHESTER, Va., SEP 21 with matching target cancel sent to Hampden Sydney, Virginia. Description: CSA #11 on cover postmarked with a 4 ring Army of Northern Virginia target cancel sent to King's Creek, NC. 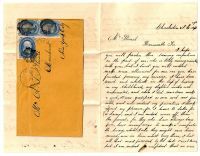 Description: CSA stampless cover postmarked AMERICUS, Ga., JAN 2 with matching "PAID" and manuscript "10" rate sent to Rossville, Geo.